[無料] AutoDrive Desktop Manager | Mac App Storeのアプリ検索・ランキング BuzzMac! ‣ Built-in Gas Stations locator so you can find stations near you based on the price of fuel, type of fuel and distance from your current location. You can even quickly get directions to the cheapest store! ‣ Get traffic alerts before your trip! Traffic Alerts will show you congestion, emergencies, weather alerts and much more! 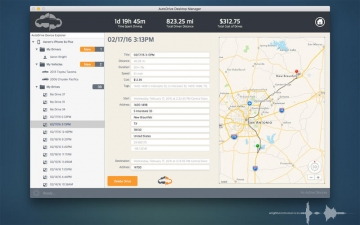 Be sure to grab AutoDrive for iOS, the companion app that automatically tracks your drives!